As the damaged Deepwater Horizon well continues to pump out 5,000 barrels of oil per day into the Gulf, all the major stakeholders are scrambling to find a way to contain the damage. Investors in BP (BP), Anadarko (APC), Transocean (RIG), and Halliburton (HAL) have had a rough few weeks and should be nervous about the future. The growing political firestorm that’s accompanied this ecological disaster is drastically reshaping the energy landscape in the U.S. There’s huge money to be made from the biggest structural change to the energy markets in the past 50 years, if you know where to look. The Department of the Interior has plans to make offshore drilling rig inspections much stricter. Interior Secretary Ken Salazar has also promised tighter environmental restrictions for onshore as well as offshore exploration and production. Lastly, in a knee-jerk reaction to the oil spill, the Senate Climate Bill gives states the right to veto offshore projects within 75 miles of shore. Although these regulatory changes aren’t set in stone yet, it’s a foregone conclusion that any company involved in offshore drilling will feel some pain. Any exploration and production company that continues to operate offshore will face reduced margins from a higher-cost structure from increased taxes, regulation, and insurance. Offshore production supplies a large amount of oil and gas to the U.S. 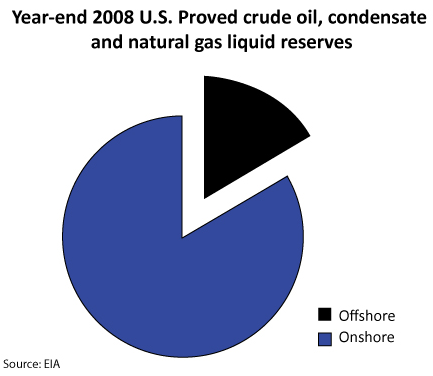 The U.S. Energy Information Agency estimates that U.S. offshore reserves account for 17% of total U.S. proved reserves for crude oil, condensate, and natural gas liquids, as the illustration below shows. Of the total known U.S. offshore reserves, the Gulf of Mexico accounts for 90%, with the rest found in California and Alaska. In 2009, BP produced nearly a quarter of all the Gulf’s oil and gas located in federal water. Shell and Chevron produced 12% and 11%, respectively. The sheer size of offshore reserves guarantees exploration and production will never be completely abandoned in the U.S., but don’t expect any growth. In fact, the Gulf of Mexico disaster probably destroyed any hope of any future drilling in environmentally sensitive areas, like the Arctic National Wildlife Reserve. The market has reacted strongly to the spill, punishing the stocks of every company involved in offshore drilling. Now many are suggesting it might be an overreaction that could benefit your investment portfolio if you dare buy in now. However, there are better ways to work this news to your benefit. The oil spill will be a very expensive setback for all the players involved in offshore production; we’ve already seen that reflected in their stock prices. In the near term, offshore exploration and production companies and the oil services companies will show margin erosion as they digest higher costs. In the medium term, some companies will pull up stakes and move completely into non-U.S. offshore projects, as they’ll realize the cost of doing business in the U.S. outweighs any potential gains. The market might be overreacting, but we’re not convinced these depressed stocks represent good value. While it’s possible there are some good bargains, it’s still too early to consider speculating in any offshore-related companies. Specifically, the threat of increased regulation, massive tax increases, and rising insurance costs will create a hostile environment for these companies going forward. Instead of risking your capital on so many unknowns, a prudent alternative is to look at energy producers in the renewable energy sector. The oil spill has only strengthened the current administration’s resolve to make greener energies supply a larger chunk of America’s energy needs in lieu of traditional fossil fuels. Congress is doing its part by giving huge subsidies to companies in this field. There are a lot of renewable options that will benefit from the subsidies and political wrangling, but our current favorite by a long shot is geothermal power. Of all the renewables, we think geothermal has the best upside potential. Based on economics and efficiency alone – unlike wind and solar energy, geothermal is reliable for round-the-clock generation and is already price competitive with fossil fuels without any subsidies – geothermal outperforms competing renewable technologies. Add the government subsidies on top of the existing good economics and the pot gets even sweeter in the short term. Once the spill is finally contained, attention will shift to previously low-key renewables, like geothermal, and soon after the market will recognize geothermal as the clear winner. We’ve researched companies up and down the geothermal supply chain and we’re seeing value in a number of quality companies that we think are poised to outperform. With the coming flood of money and attention that will be focused on green energy, you’ll want to move quickly before these bargains go away. Want to know which geothermal stocks are set to explode to the upside? Try Casey’s Energy Opportunities risk-free for 3 months today and gain access to one of the best energy analysts of our day, Marin Katusa. Marin and his energy team know all the inside details and have prepared a shortlist of the best companies to own. For only $39 per year, they will keep you in the loop on nuclear, geothermal and other renewable energies. One company the market believes will profit from the oil spill is the german manufacturer of beach cleaning machines Kässbohrer. Stock price has gone through the roof over the last few days. First the first Gulf oil spill, now we see that the second one has blown up in Louisiana. I sure hope that this doesn’t mean more environmental destruction. On the other hand, this country needs this homegrown energy. This such a complicated scenario to figure out. I’m not sure what the answer is.